Hello all, like Jayden I collect and play eldar, unlike Jayden however in fact the opposite of his eldar, my craftworld fields a warhost that consists of a guardian based army, with the odd aspect warrior exception, usually Dark Reapers. 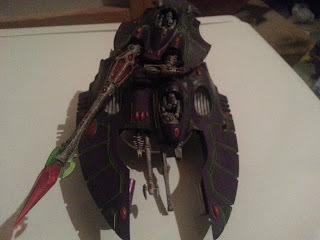 All my eldar share the same colours, purple base, white secondary, with a mix of light green and bright red accents and detailing. Minor differences occur between the aspects, linking those aspects to their original colours for example my Dire Avengers are painted like my guardians (in purple, white, green, and red) but instead have blue head crests and have blue shuriken catapults, I'll post some of my infantry once I get some of their bases finished. Now the only model of mine which I confidently feel is currently photogenic is my Fire Prism. But will post more models as they get photogenic. Missing my cockpits which is a pain as the white powdered looking crew need to be covered. Now I apologise for the slightly poor quality and lighting, my phone was dying and the only place to take a photo was away from the charger. Anyway as you can see I have a Purple base (Xererus Purple) with white (White Scar) weapons, crew, engine vents, and other bits and pieces. The gemstones were all done with the white underneath then a red painted over top (Evil Sunz Scarlet) The crystals or 'Prisms' I thickly coated in Tamiya red wash which is gives it a nice shine. In the lines of which I assume to be pure decoration I have put a very light and bright green (Scorpion Green, replaced with Moot Green) to break up all that purple which gives it a nice look in my own opinion. Once I was happy with the painting I covered everything but the crystals in Black wash (Nuln Oil). This tank is my primary tank killer, but usually on the field of battle, the pilots seem to keep a good stock of alcohol and can barely hit anything from a group of inquisition henchmen with a dispersed shot to a Land Raider with the 'Lance' shot. 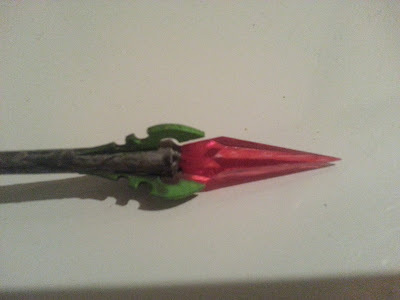 Here is an up close photo of the end prism, some of the redwash has scratched off so I might go cover it in some more. I'll post more of my things once I finish them, I'll see if I can get my night wing fixed properly and post that next.